Volleyball is a popular but highly competitive sport. It dominates the sports world right from school level games to the highest global levels. However, each team wants to project itself as a potential winner of a tournament. This has given rise to unique volleyball team names. Your volleyball team name too should convey a message to your rival teams. Are you also looking for a suitable name for your volleyball team? Well, first know that picking the right name is not easy. In fact, it may prove to be a daunting task in the end. This is because many names crop up and most of them rejected by the concerned people. To arrive at a name that everyone agrees to is surely a tough job. When brainstorming, fortunately, a Google search can throw up a great volleyball team name. There are, in fact, dozens of name idea generators you can explore. Other sites also have several team names. 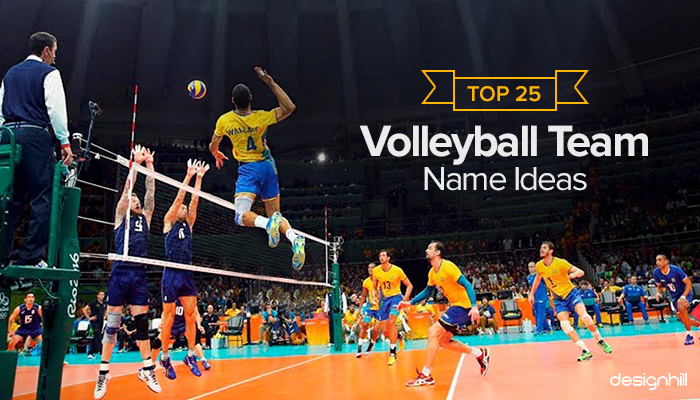 So, you have many platforms which you can visit to get names ideas for your volleyball team. But the biggest question here is how to pick the best name for your volleyball team. We will answer that question for you. When picking a volleyball team name, you need to consider some key tips. A basic tip is that whichever name you pick, make sure that it is unique and simple. Do not try to copy a famous name. Many funny volleyball team names were created after some famous one-liners, personalities, idioms, etc. Such names fail to make a good impression on the audience and the team members. A volleyball team name should be able to encourage the players to perform well. It is better to pick a name that generates the feeling of completion and challenge. While the name is simple, unique, and catchy, it must evoke the tough emotions of aggression and win. But remember that even funny team names can be inspiring. Looking For A Volleyball Logo Design? We have helped thousands of games and sports teams from all around the world with their graphic design needs such as a logo design, website design, social media posts, banner and much more. Another thing to remember is that your volleyball team name will appear on your sport logo of the team. So, choose a name that looks good on a logo. Remember that the logo will be the face of your team amid the audience. Moreover, a great logo design having a team name builds a memorable impression on the team members and spectators. Therefore, consider sports team logos also when brainstorming for your volleyball team name. Here we give you some unique volleyball team name ideas that you can think of choosing for your team. These are the volleyball team names we can suggest. These are original and unique names you can try for your team. Once you have finalized a name, create your own logo with the help of design software available on the web. Alternatively, you can hire a freelance graphic designer to do the job. With a professional name and logo, your team will make a lethal combined impact on viewers. With such a name and logo, you can hope to fight your competitors well. After you have decided on the name, your next step will be to promote your team. For that, you will need a logo, brochures, business cards, advertisements etc. In that case, you can choose Designhill as your ideal marketplace to source your design needs. Volleyball Team Jerseys – What’s Your Plan? Now that your concern related to volleyball team name is taken care of, what’s your plan for your volleyball team jerseys? With Designhill’s Artificial Intelligence powered tool you can design custom volleyball team jerseys. What are you waiting for? Select a name and get your team jerseys. A perfect volleyball team name idea is important to motivate your team members for giving their best in a competition. But the name should be unique and simple. These are some catchy and inspirational names for your team.